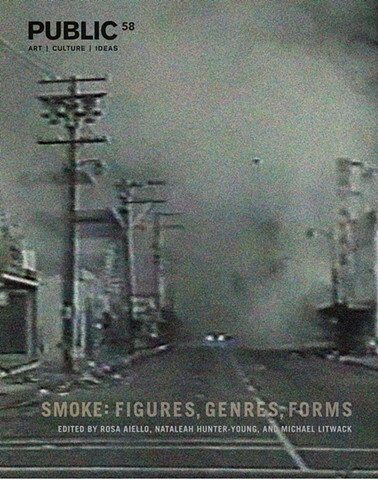 PUBLIC 58: SMOKE: FIGURES, GENRES, FORMS proposes smoke as a pressing figure of our global present that calls forth a capacious counter-archive of knowledge and sociality. 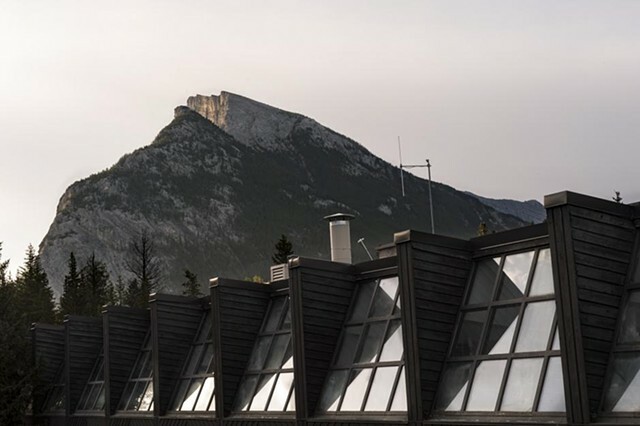 Sandrine Schaefer's contribution, Reflecting Torpor documents methods, research, and reflections on a performance artwork titled, Torpor (Pace Investigations No.5) developed on site at Banff Centre for Art and Creativity. The text engages ideas and strategies around how the acceleration and deceleration of actions can make mechanical, geological, and felt time palpable. Other themes explored in this reflective text include, surveillance, site-sensitivity, the body as material, anthropocentrism, witness participation, visibility, and TRAnsferenCE. This summer, Sandrine will participate in an artist residency at the Vermont Studio Center. Sandrine will use this time to work on finding new ways to document and share their ephemeral works. The Boston Foundation recently awarded Sandrine a 2018 Live Arts Boston grant in support of continued work on Pace Investigations No. 6! Live Arts Boston (LAB) is designed to respond directly to the needs articulated by Boston's arts community through Boston Creates. LAB provides critically needed, flexible, project-specific grants to Greater Boston’s performing artists and small nonprofit performing arts organizations to create, produce or present artistic work for Greater Boston audiences. To learn more about this grant program, go to http://www.tbf.org/lab. The Boston Foundation, Greater Boston’s community foundation, is one of the largest community foundations in the nation. In 2017, the Foundation and its donors paid $130 million in grants to nonprofit organizations. The Foundation is a close partner in philanthropy with its donors, with more than 1,000 separate charitable funds established either for the general benefit of the community or for special purposes. It also serves as a major civic leader, think tank and advocacy organization, commissioning research into the most critical issues of our time and helping to shape public policy designed to advance opportunity for everyone in Greater Boston. The Philanthropic Initiative (TPI), a distinct operating unit of the Foundation, designs and implements customized philanthropic strategies for families, foundations and corporations around the globe. For more information about the Boston Foundation and TPI, visit tbf.org. Heather Kapplow's review of Pace Investigations No. 6.2 in Delicious Line. Sandrine was awarded a 2018 Project Grant from the Waltham Cultural Council in support of Pace Investigations No. 6, a yearlong performance artwork that investigates Waltham's historic role in the mass synchronization of mechanical time, considers pre-colonial understandings of time buried by Industrialization, and proposes ways time might be felt and measured in the future. "Sandrine Schaefer expressed some glee when she told me that she would be changing the speed of the escalators for her piece. 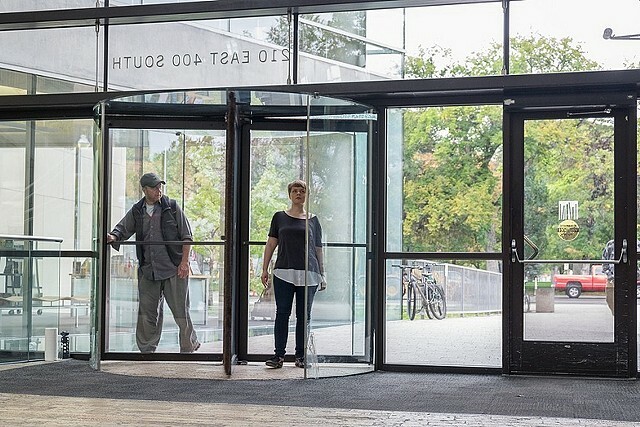 Look for her there, possibly in camouflage.This performance builds upon an earlier piece where she stood in a revolving door to the Salt Lake City Library, situating her body to reveal the tacit social agreements that happen every day without us even noticing. Exposing this evidence of cooperation opens a strange well of intimacy and optimism. What can happen in these between-places where we all behave without even realizing it?" Preview of CONCRETE ACTIONS by Amelia Mason on WBUR. This Fall, Sandrine will be teaching a new course through the Experimental College at Tufts University. Registration is currently open for Tufts students. %How is art changing in a climate where many in the Western world have access to technology and social platforms to surveil one another? How does the ubiquity of media surveillance influence artists practicing today? How is the spectatorship of art changing in a society under constant surveillance? This summer, Sandrine will be participating in the Banff Research in Culture program - The Year 2067! During this 5 week program, creative thinkers gather to ask what the world might look like in fifty years and how we might shape it. Moving beyond apocalyptic predictions, post-apocalyptic theories, and techno-utopianism, this program aims to shake up our sense of the political, social, and environmental. 2067 asks us to prod and plot the pathway from a present that needs work, to a future that works better. During this residency, Sandrine will be developing a new iteration of her ongoing project, Pace Investigations that utilizes time structures inspired by premonitions of how time might be understood and measured in the year 2067. The Boston Foundation recently awarded Sandrine Schaefer a Live Arts Boston grant in support of a new iteration of Pace Investigations sited in Waltham, MA, also known as "Watch City". 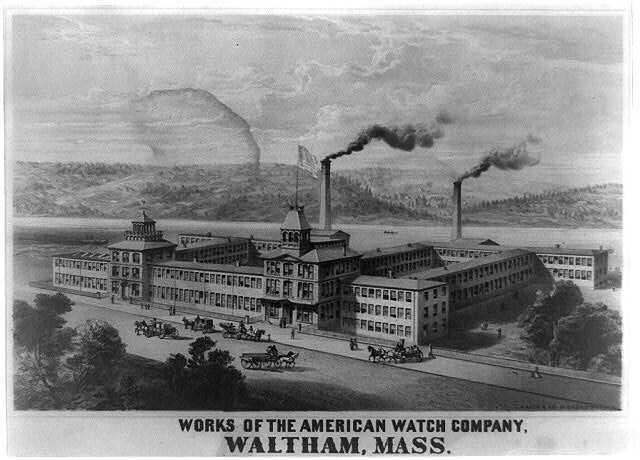 In the 1850’s, The Waltham Watch Company developed machinery that could produce interchangeable watch parts. This revolutionized the mass production of timepieces on an international scale, making watches more affordable and accessible than ever before. Waltham has been praised as a site that changed the “world’s time consciousness." Pace Investigations explores Waltham's historic role in the mass synchronization of mechanical time, while also resurrecting buried time structures. How was time measured in pre-colonial Waltham? Waltham is currently enduring rapid gentrification. How is time consciousness in this location changing during this transition into its future? For updates on this project, please sign up for Sandrine's seasonal newsletter. Live Arts Boston (LAB) is designed to respond directly to the needs articulated by Boston's arts community through Boston Creates. LAB provides critically needed, flexible, project-specific grants to Greater Boston’s performing artists and small nonprofit performing arts organizations to create, produce or present artistic work for Greater Boston audiences. To learn more about this grant program, go to www.tbf.org/lab. Sandrine was recently awarded an Assets for Artists 2017 Matched Savings Grant. Sandrine is 1 of 12 Massachusetts-based artists enrolled in this program that supports artists working across artistic disciplines by providing funding and professional development services. Sandrine was named 1 of 10 local artists as a 2015 Brother Thomas Fellow through The Boston Foundation. The Brother Thomas Fund honors the life of Brother Thomas Bezanson, a Benedictine monk and ceramist whose work can be found in museums nationwide. Cate McQuaid's review of Sandrine's work published in The Boston Globe. Pick up a copy of the Improper Bostonian to read Scott Kearnan's feature, Off the Wall: With new Institutional Support, Performance Art is Moving from the Margins to the Museum Floor.Sandrine is quoted throughout. Sandrine's interview with Big Red & Shiny about The Foster Prize Exhibition! The four, 2015 ICA Foster Prize recipients announced in Art Forum. Image from Sandrine's This is an Archive of... is used as the announcement image. Sandrine Schaefer has been named one of The Institute of Contemporary Art's James and Audrey Foster Prize recipients. 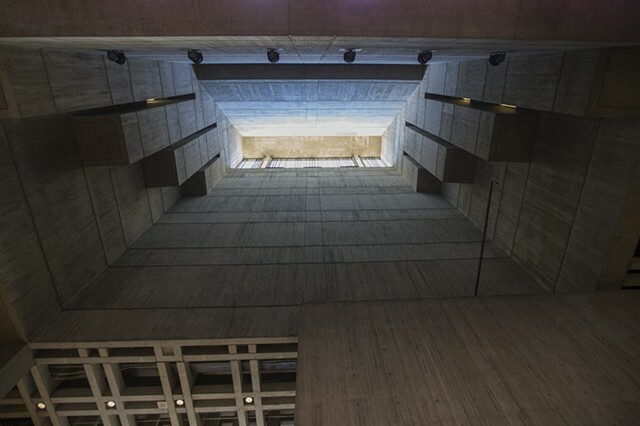 Beginning in April, Schaefer will create a piece comprised of 5 performance art works that site the spaces in and around the ICA Boston's waterfront, Founders Gallery. Each live performance art piece will leave traces that accumulate in the space, shifting the audience's sensorial encounter with the site. Congratulations to her fellow winners: Vela Phelan, Ricardo DeLima, and kijidome. Check out Sandrine's recent interview on the Other People's Pixel's blog. "A piece by Sandrine Schaefer and Phil Fryer, titled Untitled View participated in this realm of activity in a performance about (as much as aboutness is an available quality for work of such simplicity) the action of looking. From the afternoon until the evening, over hours rather than minutes, Schaefer and Fryer stood variously distant from each other, and looked at art. The piece created no feeling in the pit of the stomach in the way Arsem's did, no frissons: but then we weren't directed here to an elemental human experience, but to a politics of viewing and social space. "People would move around my gaze," Schaefer related at the evening's panel, "sometimes people would come and look with me, which was nice". But this piece, for me, was ultimately not about activating the objects viewed. Watching the pair looking, I was struck by the way prolonged, premeditated activity contrasts and heightens the frenetic spectacle of "ordinary" human behavior, even when the action is ostensibly congruent with the objective of the crowd: the patrons, too, were probably there to look at art, but much is changed by a tempo and quality of attention less deliberate and less vast. In Untitled View this textural difference rose to the surface." Visit the 2013 Rapid Pulse International Performance Art Festival's blog to read Sandrine's writing about select performances. Sandrine is quoted in this Boston Globe article written by Cate McQuaid on the current climate in Boston for Performance Art. "Next into the room was Sandrine Schaefer. Sandrine began her piece with a large glass vase full of water sitting in the middle of the room as she walked along the wall eating a banana. Stopping in the corner, she finished the banana and dropped the peel on the ground, then stood staring at the vase for a moment. Eventually she walked over and picked up the vase, which turned out to have a hole in the bottom. She plugged the hole with her finger and walked back over to the corner. She did her best to contain the water but a steady trickle ran down her knuckles to the floor. The vase was tall enough that with the base of it held down by her waist, the top came up to her chin, and at an angle where she slightly rested her face in the opening while standing there. After about fifteen minutes, showing fatigue from holding the weight of the vase, Sandrine carried the vase outside and allowed the contents to drain out onto the grass as she walked the length of a ledge outside the gallery. Once it was empty, she re-entered the gallery and placed the vase where she had been standing, then sat in the middle of the floor and ran out the remainder of her hour watching the condensation from her breath slowly evaporate from the surface of the glass. For the audience it was a combined experience of watching the vase, watching Sandrine as she sat as still as possible, and fitting the pieces together. The piece could be viewed as a durational exhibition, or you could look further into the space that was occupied by Sandrine and these objects. The relations between these spaces and the transitory states of being that they went through are things that happen all around us every day, and Sandrine’s piece turns the viewer’s focus toward contemplating these ubiquitous principles of existence. If she had stood there long enough, all the water in the vase would have eventually drained out and we would have seen the vase go through a full change in its state of being from full to empty. The corner she stood in was occupied, then empty save for the remnants of her being there: the vase and the banana peel. Then there was an immediate remnant of Sandrine in the vase while the condensation was there, but once it disappeared all immediate traces of her body ever being there were, too. There were also several stratifications of states of permanence displayed within the piece, albeit abstractly. The least permanent object in the performance was the water. If all the water drained onto the floor it would have completely evaporated within a couple of hours. As an object, water holds a very short presence. After that is the banana peel. Given enough time, it would biodegrade and also disappear. Next is Sandrine herself. If enough time passed, Sandrine would also biodegrade and disappear, leaving only the vase. Then after hundreds of years the vase, and also building, would eventually disappear, leaving only the space itself as the one true permanent presence we can count on, at least as far as we’re aware. "